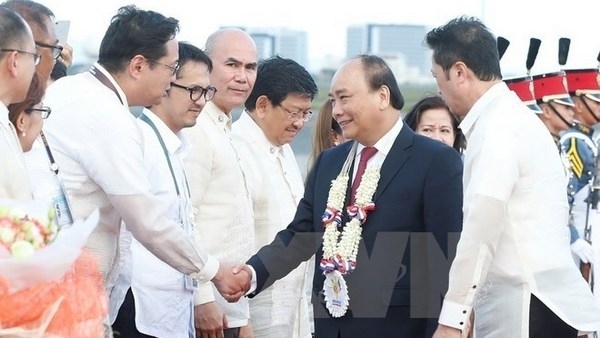 Prime Minister Nguyen Xuan Phuc arrived in Manila, the Philippines, on the afternoon of November 12, to attend the 31st ASEAN Summit and related meetings from November 12-14. Along with the 31st ASEAN Summit, the PM and the Vietnamese delegation are scheduled to participate in the 20th Meeting of the ASEAN Plus Three (China, Japan and the Republic of Korea), the ASEAN meetings with China, Japan, the Republic of Korea, India, the US, Canada, the European Union, and the United Nations. The PM will also attend the East Asia Summit, which includes ASEAN and its eight dialogue partners - Australia, China, India, Japan, New Zealand, the Republic of Korea, Russia, and the United States. 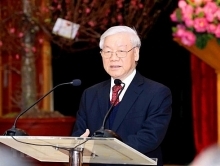 On the occasion, the Vietnamese leader will join the ninth Mekong-Japan Summit and Regional Comprehensive Economic Partnership (RCEP) Leaders’ Meeting. The 31st ASEAN Summit is the most important event of the Association of Southeast Asian Nations that groups Brunei, Cambodia, Indonesia, Laos, Malaysia, Myanmar, the Philippines, Singapore, Thailand, and Vietnam. As many as 55 documents are expected to be signed and adopted at the meetings. The Philippines will also issue nine declarations from the Chair of the Summits.